Jungle Tamers are Commercial Garden specialists for all your business planting and maintenance needs. Wherever you live we are able to help you. We can work with you through email and digital imaging, so that you can be kept up to date at all times and see the work as its being done. Our team consists of a range of enthusiastic and hardworking people who have a strong passion for gardening. Dealing directly with the owner means you can be assured the work gets done to the highest standard. 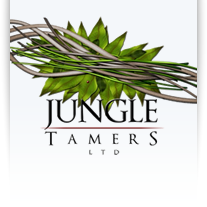 Jungle Tamers Ltd is not a franchise but a locally owned business.